Intended UseHuman CCL2/MCP-1 ELISA Kit allows for the in vitro quantitative determination of CCL2/MCP-1 , concentrations in serum, Plasma , tissue homogenates and Cell culture supernates and Other biological fluids. specificalProduct Information: CCL2/MCP-1 (human) ELISA Kit: Colorimetric Assay for Quantitative measurement of human CCL2/MCP-1 in serum, plasma, urine & cell culture supernatants. Detection Range: 2 pg/ml - 500 pg/ml. 100 assays. Background: Biobool's Human MCP-1 (Monocyte chemoattractant protein-1 also called Monocyte chemotactic protein-1) or chemokine ligand 2 (CCL2) ELISA (Enzyme-Linked Immunosorbent Assay) kit is an in vitro enzyme-linked immunosorbent assay for the quantitative measurement of human MCP-1. This assay employs an antibody specific for human MCP-1 coated on a 96-well plate. Standards and samples are pipetted into the wells and MCP-1 present in a sample is bound to the wells by the immobilized antibody. The wells are washed and biotinylated anti-human MCP-1 antibody is added. After washing away unbound biotinylated antibody, HRP-conjugated streptavidin is pipetted to the wells. The wells are again washed, a TMB substrate solution is added to the wells and color develops in proportion to the amount of MCP-1 bound. The Stop Solution changes the color from blue to yellow, and the intensity of the color is measured at 450 nm. This ELISA kit shows no cross-reactivity with any of the following cytokines tested: human BDNF, BLC, ENA-78, FGF-4, IL-1alpha, IL-1beta, IL-2, IL-3, IL-4, IL-5, IL-7, IL-8, IL-9, IL-10, IL-11, IL-12 p70, IL-12 p40, IL-13, IL-15, IL-309, IP-10, G-CSF, GM-CSF, IFN-gamma, Leptin (OB), MCP-2, MCP-3, MDC, MIP-1alpha, MIP-1 beta, MIP-1delta, PARC, PDGF, RANTES, SCF, TARC, TGF-beta, TIMP-1, TIMP-2, TNF-alpha, TNF-beta, TPO, VEGF. 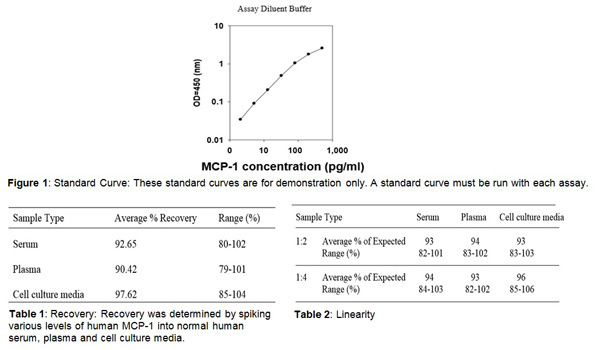 The minimum detectable dose of MCP-1 is typically less than 2 pg/ml. Detection Range: 2 pg/ml - 500 pg/ml. The intra-Assay reproducibility is CV<10% & inter-Assay is CV<12%. Summary: Detection method- Absorbance (450 nm) Species reactivity-human Application- Quantitative protein detection, establishing normal range, validation of antibody array results, strip plates and additional reagents allow for use in multiple experiments. Inquiry About Human CCL2/MCP-1 ELISA Kit If you hope to order it or contact us directly, please contact us via sales@biobool.com. We will get back to you in 12hrs,Thanks!